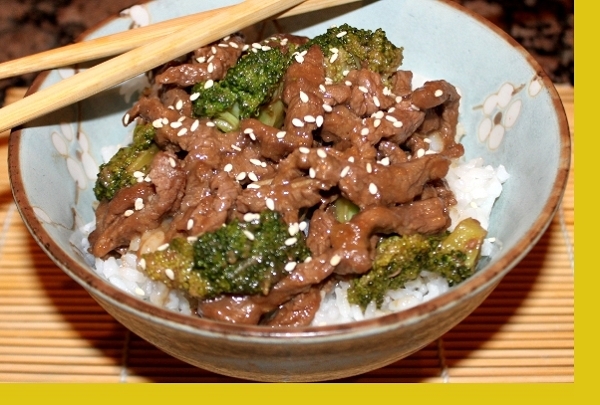 This is a traditional Asian beef and broccoli dish in a savory stir-fry sauce. The sirloin steak is cut perfectly thin with the broccoli providing a nice bit of crunch. Served with white rice, it takes just minutes to prepare and is the Asian comfort food your family will love. Sirloin steak, broccoli, hoisin and soy sauces, garlic and spices. Served with rice. 1. Add the cornstarch to the bag of meat. Shake until evenly coated. 2. Heat a wok or large skillet with 2 Tablespoons of oil. Add Meat and stir fry for 2 Minutes. (Don't over cook) 3. Add broccoli and sauce to the meat and continue cooking for 5 minutes. 4. Microwave rice until heated and serve with beef broccoli. Everything we have from Maria's never disappoints! Although this wasn't our top favorite it was good. My husband thought it tasted like a restaurant -- which I consider a plus - but wasn't his favorite. The rice was perfectly cooked. This was a fast easy meal. The beef was very tender and the broccli was fresh. We really enjoyed it! Great dish...super easy to prepare and the whole family eats it up. Really good and very easy to fix. Love this service! 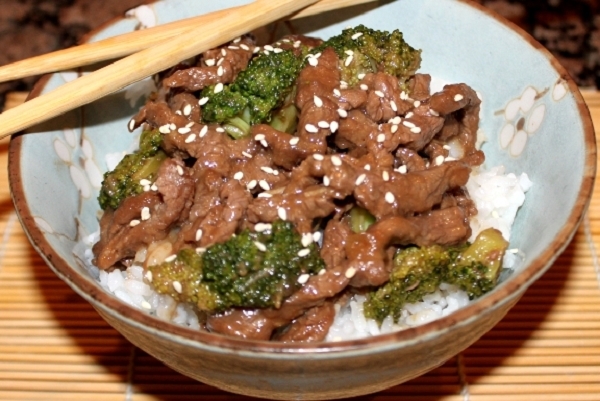 My husband and I love the Asian beef broccoli. With Maria's freshly prepared sauce,the meal gets just perfect for our palet. Moreover, with the cooking instruction on the package, it has made my cooking so easy and fun!We have been Maria's customer from the get go, and this meal has been a part of our monthly order. Thank you Maria! Delicious! I forgot to coat the beef but prepared it as instructed otherwise and it was so GOOD! Beef Broccoli Stir Fry- The broccoli was cut into perfect little bite size pieces & the beef was very tender- I loved it. Oh man this was good!! My husband and I loved it! This is way better than any restaurant Chinese food... we gobbled it up! Her instructions are spot on, down to the exact cook time for meats, etc. Thanks, Maria. Lots of flavor, delicious, one of our favorites!! My family was impressed with this flavorful dish. I have to admit that I'm not a huge fan of beef and broccoli so I almost passed this one up. I'm really glad I didn't, because this is my favorite dish so far! It wasn't hard to prepare and the flavor is outstanding! Next time, I think I might add some mushrooms and onions because they would work great with the flavor of the sauce. I'll definitely be ordering this dish again. This was the first meal we ever had from Maria's and is still our favorite! Preparation is pretty simple but the flavor is incredible! So quick & easy to make. My whole family enjoyed it. I was glad my kiddos ate their broccoli without any complaining ;) When they were done, they asked for seconds! Easy to prepare and generous portions!